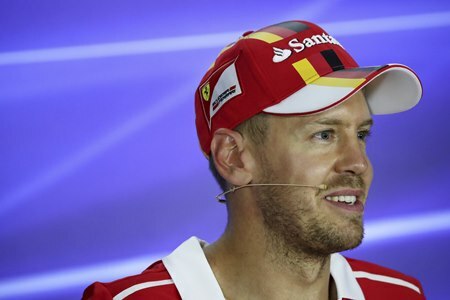 Singapore (AP) — Having clinched pole position and with his rival qualifying in fifth, Sebastian Vettel is perfectly placed to wrestle back the championship lead from Lewis Hamilton in Sunday’s Singapore Grand Prix. On one of Formula One’s hardest tracks for overtaking, even as talented a driver as Hamilton will be pushed to secure a podium. Barring a terrible start from Vettel, or a race incident, the odds on Hamilton maintaining his slender three-point lead over Vettel look slim. When asked what a realistic result would be, Hamilton sounded deflated. Few of Vettel’s 49 pole positions will have given the German driver as much pleasure as this one at the Marina Bay circuit, where he holds the record for wins (four) and podiums (six). Vettel’s delight was evident by the high-pitched and prolonged shrill he let out after his lap record of 1 minute, 39.491 seconds. So loud-sounding it might have resonated all the way back to Maranello, the Italian home of Ferrari. When he’d finally finished screeching, a breathless Vettel praised his team in Italian over radio, shouting “Grande Lavoro!” (Great work!). He could hardly control his emotions when speaking on the grid moments later, either. Some contrast to his mood on Friday night. Vettel had struggled considerably during second practice session, placing only 11th under the sticky floodlights. The overnight transformation worked wonders. Vettel praised Frenchman Charles Leclerc, an aspiring young driver who is leading the F2 championship and also part of Ferrari’s junior program. Leclerc did simulator work late into the night at Maranello, aimed at ironing out the car’s glitches. Mercedes will be the ones having a sleepless night this time. While Hamilton lacked pace, his teammate Valtteri Bottas found no rhythm and placed sixth. Even worse for Mercedes: Ferrari’s Kimi Raikkonen is fourth on the grid. Now that Raikkonen is effectively out of championship contention, the Finnish driver will be a crucial ally in helping Vettel attempt to win a fifth world title. Just before the summer break, Raikkonen defended brilliantly to fend off both Mercedes cars and enable Vettel to win in Hungary. Even if Hamilton overtakes Raikkonen, he then has to get past both Red Bulls. The Red Bulls will take some beating, too. Daniel Ricciardo, with six podiums in the last nine races, has looked in great form here — dominating Friday’s two practice runs with then-record times and qualifying in third. His teammate Max Verstappen, one of the most aggressive drivers in F1, starts ahead of him in second. No wonder the mood in the Mercedes garage was glum. The 5-kilometer (3.1-mile) track, with its 23 corners, greatly reduces speed and was expected to favor Ferrari — and perhaps Red Bull — over Mercedes. But not to this extent. Wolff shook his head as he looked on anxiously from the team garage. Vettel will be sleeping more easily. His impressive streak at the night race includes three straight wins from 2011-13 during his run of four straight F1 titles with former team Red Bull. And while Hamilton arrived here in better form, having won in Italy and Belgium on tracks more suited to Mercedes, he also conceded that Ferrari has the clear edge.